Volunteer and Service Enquiry Southern Africa (VOSESA) was a non-profit research organisation based in Johannesburg, South Africa. Founded in 2003 in response to the clear need for well-researched and up-to-date information on volunteering and civic service in southern Africa, VOSESA ran for 10 years before closing its doors at the end of 2013 owing to insufficient funds being available to continue its work. In that time VOSESA conducted 16 studies on a wide range of topics, convened four learning activities and promoted evidence-based advocacy through publications and workshops undertaken within its regional and international networks. 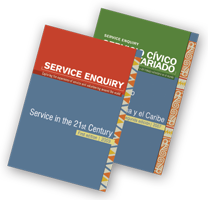 To be a point of reference for knowledge about civic service and volunteering for development in the SADC region. 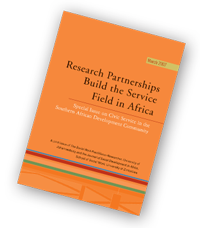 To support the growth of knowledge about civic service and volunteering in the SADC region through research, publishing and evidence-based advocacy. • Influence voluntary service policy and practice, drawing on its research.